The Boken Every Day Diaper Bag is one bag you won’t mind carrying around. Many diaper bags are designed for the baby. That’s great, because of course, it’s made for babies. But the baby doesn’t often look at the bag, and definitely isn’t going to be the one carrying it around! So why not design the bags for mommy and daddy? In comes Boken, with the stylish, compact, convertible Every Day Diaper Bag. The name says it all – this bag is made for every day use, and I’ve found that it works nicely even as a bag for day trips with toddlers! The first thing you see about the bag, the packaging is very nicely done. After removing the card stock wrapped around the bag, I found a small 8×10 or so satchel with a handle and zipper. Open the zipper and the first thing that comes out is a matching and rather nice looking changing pad. It’s a far cry from the black and white, sticky vinyl pads included with many diaper bags I’ve purchased. Also, while still being waterproof, it is very thin and folds up nicely. It is twice as large as most I’ve seen, being a square instead of a long pad with just enough space for baby. This will cover an entire changing table or lay out on the floor with space to sit clothes and wipes on it too! When I pulled out the diaper bag, I found that the satchel it was in was actually an inner storage pouch of the diaper bag itself! That’s crafty packaging, and keeps down waste a lot. There aren’t the filler papers many diaper bags use to keep their form, and minimal wrapping on the outside that’s all recyclable. Once pulled out, the Every Day Diaper Bag is about the size of a small adult back pack. On each side there are small handles for carrying, or you can use a longer shoulder strap like many diaper bags include. It also has the added benefit of backpack straps, which are hidden in a compartment on the back of the bag when not being used. That same compartment is extremely roomy, and would be ideal for the changing pad and diapers, or books or even pamphlets you might get while out traveling. One side of the bag has a very tall and spacious elastic mesh pocket for drinks, but will fit anything you want, unlike many bags that only go halfway up a bottle or sippy cup, allowing the risk of falling out while walking around. The other side has a roomy pocket with surprisingly strong velcro closure. Each of these pockets are about 10-12 inches tall. The front has two large pockets, and the main enclosure is just huge. The pouch that held the bag when packaged is at the top of the main compartment, and an elastic mesh separator gives extra organization at the bottom of the compartment. The only aspect of the bag I didn’t like at first is simply a requirement of the design. To make it foldable and resistant to water and dirt, so it’s able to be wiped clean, a material was used that is pretty noisy at first. The almost crinkly noise reduces as you use the bag and the material starts to soften. I would also love if there were additional pockets or dividers on the inside of the bag, since most of my use will be for day trips when I might need to grab something very specific out of a large and fully packed bag. Otherwise, this bag is nearly perfect, especially with toddlers or on trips. And if you just want an extra bag in case you come home with more stuff than you left with, the bag folds back up into the pouch to take up minimal space until needed! This is definitely the bag we’ll be using when we visit family or take a day trip to St. Louis or Chicago – with or without the kids! Youcopia was chosen to be included in our 2013 Holiday Gift Guide! Are you looking for that perfect gift? Check out the gifts on our list and you might find just what you were looking for! Family Centsability was not monetarily compensated for this post. A product sample was provided in exchange for an honest review. All opinions expressed are our own. Small Concept has given me the opportunity to review their website as well as give away a $25 Small Concept gift card to a lucky winner!! See more information about Small Concept in my review. The only mandatory entry is to tell me a product you like from the Small Concept website! To be eligible to win, please complete the first entry on the Rafflecopter giveaway widget below. All links above are also available in the Rafflecopter widget below. Please be honest in your entries because the winner’s entries will be verified. If the winner’s entries are false, a new winner will be picked. The winner will be contacted by Family Centsability (familycentsability@gmail.com) and they will have 48 hours to reply with their mailing address. This information, including the winner’s email address will then be forwarded on to Small Concept who will then send the prize to the winner. Good luck! As many of you know, I am pregnant with my second baby – another boy! I started looking for maternity clothing early in pregnancy since my belly started growing a little faster this time, and I came across the Small Concept online maternity boutique. Small Concept started as a children’s boutique and introduced maternity wear into their collection in 2011. Small Concept owner and blogger Julie strives to provide quality products and excellent customer service. Being a mother and grandmother, Julie devotes her life to Small Concept which revolves around her love for children. I was given the opportunity to work with Small Concept to review a product and their online boutique. Whether you are looking for maternity, baby clothing, toys or to just see what is on sale, the navigation of the website is very simple with links along the top and very bottom of every page. You can find everything you could need: baby swim wear, cloth diapers, puzzle toys, maternity dresses… even bedding and organic candles! Shipping is a reasonable $5.95 flat rate fee through USPS for US residents. Don’t walk away yet if you aren’t from the US – they do ship internationally! As I browsed around the boutique, I was drawn to the maternity clothing since that was in fact what I am in need of. I found maternity swim wear by Prego and loved the Black Dot Retro Halter set. Being pregnant, the 100 degree weather outside has been unbearable, but as soon as my swimsuit arrived, I took a dip in the pool and cooled off! The halter top has strong ties around the neck, has molded cups and is a perfect length for my growing belly. The pattern was just as cute as it looked online and I was so much more comfortable than in a bikini top! The black matching bottoms tie on the sides and were quite comfortable as well. If you are not pregnant but already have a child, you will no doubt find something in the Small Concept boutique. I will definitely be keeping an eye out on this store as my sons grow! Be sure to visit the Small Concept website and browse around! Disclosure: This blog contains sponsored content and affiliate links which, when used, help support this site. Hello! I am Danielle, homeschool/working mom of a Kindergartener and a 2nd grader in northern Illinois! I have a bachelor's degree in Mass Communication, a 3rd degree black belt in Tae Kwon Do, and lived in Hawaii with my husband before our sons were born. Daniel and I co-write on our blog, Family Centsability, sharing recipes, printables for elementary aged kids, product reviews, and other family-friendly resources. 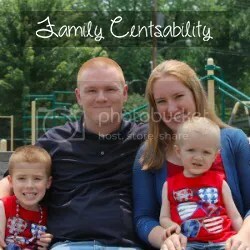 Email us at familycentsability@gmail.com for review requests, advertising inquiries, or simply to say hello!